Ever since I was little, I always really liked astrology. I loved reading my horoscope and using it as a guide for my days. When I was in college, my sorority sister was very much into astrology and she wouldn't even talk to a guy if he wasn't a compitable sign with her. While I'm not THAT much into astrology, she definitely rubbed off on me. I started becoming obsessed with horoscopes, following everything very closely and even learning more about my sign and the characteristics of myself and other people. I think the reason I am so interested in astrology is because it gives meaning to otherwise mundane things. Having the planets be the reason for things happening here on Earth give some sort of comfort to those who believe. Like there is something else controlling us -- it's very weird to think about but it's my truth. One of my favorite parts about astrology is Mercury Retrograde (which we are in right now) and seeing how it really affects communication, travel, and technology in our everyday lives. I really do believe in it, and I will try to minimze big decisions, purchases, and any types of controversial communcation during these days. The trains, my computer, and phone are always a mess during Mercury Retrograde and I whole hearedly believe that this is all true. Astrology goes even deeper with what the planets mean and do, the full moon cycles and how they affect us, and truly anyhting else related to the planets and stars. There is a lot more I want to learn, and I think I just need to find the time to really sit down and study it. I do have the resources; a while back I bought the book 'Bedside Astrologer' and this is great for beginnners because it gives you everything in very easy terms and goes through all the signs and characteristics, and then it breaks down everything in terms of romance, and then gives you more information on the planets and how to read your horoscope and what certain things mean. 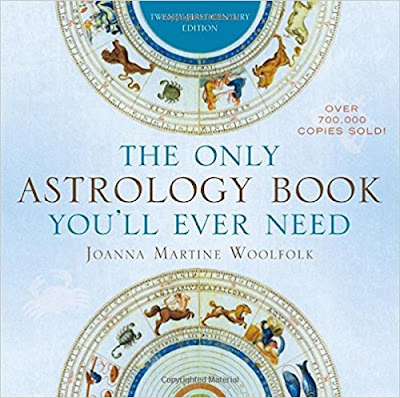 Another book I have my eye on is called "The Only Astrology Book You'll Ever Need". I saw it on Instagram and it looks like the next level verison of Bedside Astrologer and looks really wonderful. All in all, I think astrology is super cool and it's something I've never talked about here on the blog and I thought it was time! You don't have to take it seriously but it is something fun to take part in and it really makes you think about the world in a different way. Are you into astrology? What are your thoughts?